I've thought about using my dresser as well. There's no mirror, but I think I'd find that distracting anyway .. the space is nice and large, and that's what I need. Here's my current shrine/altars : one seasonal and a simple lunar one. Link because I fail at BB Code! Right now my alter is a shelf in my closet. (Thankfully its a large walk-in) I have four children under the age of 6, so I can't have it set up anywhere permanently. 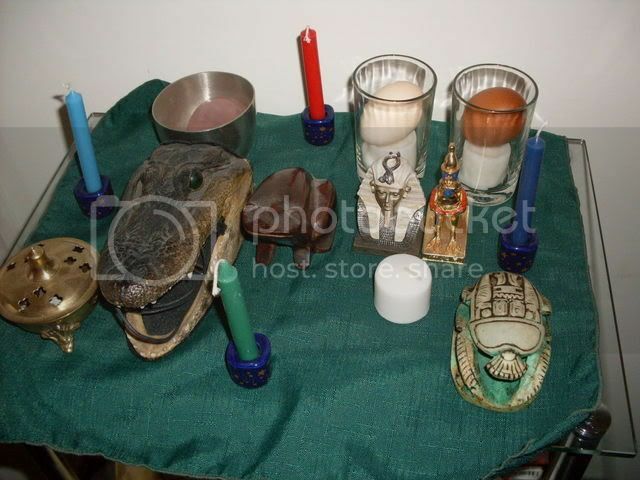 It's fairly simple for the time being....an alter cloth, a few candles, my favorite stones, a couple bowls, my chalice. In about 5 more years I should be able to have my regular alter set up again, but that means my babies wont be babies anymore, so I'm not sure I like the trade off. Well your further then I am... I'm just thinking about it right now. it would actually make a good one... I think there is enough space on it. I actually got around to cleaning mine off and moving it to a new home yesterday.. just some inspiration for you! 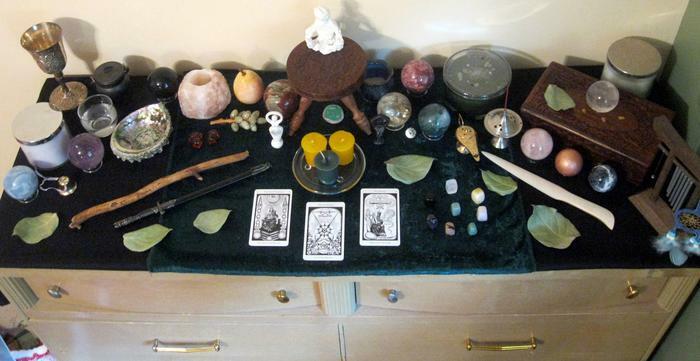 Here is my altar from Ostara 2010. I DID it! I spelled altar as alter!!!!!!!! I offer no excuses I apologize. If I do it in the future, tell me to get some more sleep, OK? Er... did you mean to ask if she prayed to 'dieties'? (I know, I know, I find it incredibly difficult to misspell something when I intend to too. First off, I have that same Bast statue. =) My mother got it for me back in like 2006. I adore it! I have no altar at the moment but was planning in setting one up when we've re-arranged a few rooms. I think I'm going to have to something similar with a 7 year old and a baby to contend with. I just don't have any cupboard space spare so will have to get my thinking cap on. I really miss not having a focus point to my path. I love this one!!! Is that a crocodile head or an alligator head? I can never remember which has the more rounded snout! I just realized that it looks like the frog is nuzzling the alligator/crocodile head (yeah, I don't know the difference either). Page created in 0.316 seconds with 54 queries.